Jose Javier Rodriguez launched his campaign among friends and family at Domino Park. Listen to the audio version of the story. For many, Miami's Domino Park is a sanctuary where spirited conversation between locals float over the slapping of dominoes on plastic tables. On Wednesday morning, the space on the corner of Southwest Eighth Street and 15th Avenue became the center of another activity: the announcement of a candidate entering a U.S. congressional race. 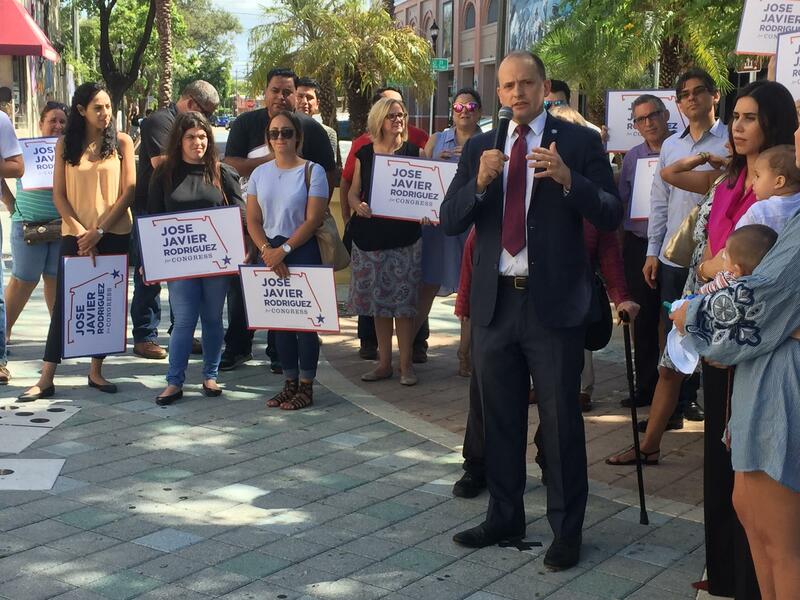 State Sen. José Javier Rodriguez, a Democrat, launched his campaign for Florida's 27th Congressional District – a district that he's lived in or represented for much of his life. He is hoping to make the transition from the state Senate to the seat currently held by Republican U.S. Rep. Ileana Ros-Lehtinen, who is retiring in 2018. "I grew up here in Miami, Cuban-American," Rodriguez said to a crowd of family, friends and press. "My father came here from Cuba as an exile at a young age and achieved the American dream, and that's something he really imparted to my brother and I." If he makes it to Washington, D.C., Rodriguez wants to be a champion for affordable health care and push for action on climate change. He says that District 27, which includes most of Miami, Miami Beach and Key Biscayne, has a lot to lose if sea level rise isn’t addressed. "It's a very diverse district. It's a district that ... in some of the most contentious elections in the state, we have been able to prevail by a message focusing on what the district needs," he said. Other Democrats in the race include Miami Beach Commissioner Kristen Rosen Gonzalez, Michael Hepburn and Scott Fuhrman. Announced Republican candidates are former Miami-Dade School Board member Raquel Regalado and Miami-Dade Commissioner Bruno Barreiro.